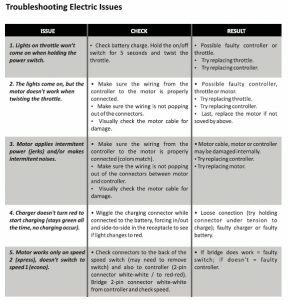 We list FAQ’s below by Category: Body Powered and Electric Models separately. Check our Trikke Products Timeline. Where can I find the Serial Number on my Trikke CV? Please note T5 and T6 models do not have serial numbers. The most common problem with clamps not locking the handle bar to the frame of the Bikee is because the bolt that tightens the clamp was inserted in the wrong side. Please check the bolt closes the clamp when you tighten the bolt, otherwise insert the bolt in the hole in the opposite side. I bought this Trikke to get in shape and have fun but can the Trikke sustain my weight? All of our Trikke vehicles are recommended to support up to 250lbs but we do have some customers weighing 300lbs that use with moderation, avoiding downhill, curbs, jumps and are happy with it. We recommend you try one before buying it to see how you like it. Check the tire air pressure with a gage and pump it until it meets the 80 psi in the rear tires. Adjust the angle of the handlebar according to the instructions. With a hammer hit the center of the axle (three times or more if needed). This should adjust the seating of the bearings and then try to spin the wheels again. No, they don’t. The first T8’s chrome aluminum version I and II don’t accept air tires. You could replace the whole front fork with air tire and wheel axle in the front but nothing can be done in the rear wheels. Wheel alignment push pin or is stuck in steering axle? Using the Allen wrench that came with your Trikke, find the hole in the plastic cap located at the bottom of the steering axle. Insert the short end of the Allen wrench, remove the cap by prying it out with the Allen wrench. You should now be able to reach the pin and push it back into place. If the alignment pin is missing please contact Trikke Tech (1-877-487-4553 4553 ext 200 or 101) for a replacement pin. Open clamp on quick release lever. Remove the bolt located in the quick release lever. There is a plastic bushing that keeps the handlebar stem post tight when the quick release clamp is engaged. This bushing can make the handlebar stem post removal a little tough because of the tight fit. After completing steps 1 through 3, the stem post will pull out. Just give the stem post a few tugs and the bushing will come loose. Once you have the stem post removed you should be able to push the pin back into place using a long stick or dowel. Once the pin is in place, reinstall the stem, quick-release and the handlebars. This can happen because of excess paint or burrs in the fork alignment hole. To fix, use a small round file and clean the fork hole. Once this is done your fork should install with no issue. This happens for abuse or letting your Trikke roll backwards. Measure the distance of the outside of the decks. This distance should measure 23 inches aprt, +/- 1 inch. If the distance is further or closer than 23 inches, you can push the arms in or pull them apart depending on the correction needed. You can do this a few times before you mave major problem (because T67, T78 are steel). Remember riding backwards voids the warranty on Trikke vehicle. Place one finger against the bearing on one side and keep this finger stationary, with your other hand place a finger on the bearing on the other side of the wheel. Turning one finger and keeping the other stationary try to manually turn the bearing. If you can’t feel the bearing trying to turn with your stationary finger remove the wheel bearings. Check the bearing seat for debris. Remove the debris if there is any present. Check the measurement of the spacer between the bearings, For the 8.5 tires this should measure 26mm. If it is too short or too long you will need to replace the inner bearing spacer. If you have done this and your bearings just seem to not spin freely they may need to be replaced. Please call Trikke Tech support to resolve your issue. Remove the polyurethane wheels using two 5mm Allen wrenches. Using a pair of pliers and a 5mm Allen wrench remove the brake pad axel bolt and the brake spring. Note: Move the brake location one at a time so you can use them as reference for spring position and orientation. There are three holes on the frame for the brake pad axle bolt location and three holes for the spring. For your brakes to function properly you will need to move the location of the brake to the third hole furthest from the wheel axle. Position the spring first; make sure the spring is in the right orientation. Once the spring is moved, move the brake pad by placing between the windings and under the spring. Install the brake axle bolt. Make sure the bolt goes through the frame, spring and brake pad. Once you have the brake pad axle in place do not tighten the brake axle nut yet! First install the air tires using the new wheel spacers that were included with your tires. When installing the tires make sure that the arrow on the side of the tire is facing in the forward direction. (The air tires are directional). Once the tires are installed you will need to adjust your brakes. Loosen the two bolts that hold the cable to the brake pad using a 3mm Allen wrench. Pull the cable toward the front of the Trikke leaving a slight gap 3mm to (1/8″). 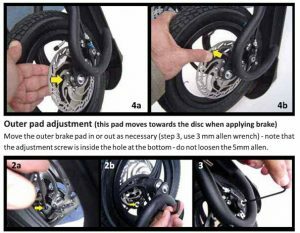 The Desired result is to set the brake pad as close to the wheel as possible without the brake pad rubbing on the tire. Keeping your cables turned like this will optimize the operating effectiveness of your brakes. Now tighten the bolts back to hold the tension on the brake cables. 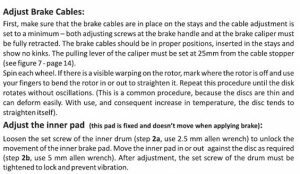 Note: If you have difficulty removing the slack from the brake cable there may be a kink or slight bend in the cable. Check to insure the cable is not bent or hung up somewhere in the brake line. Return the brake lever adjustment knobs to their seated position. Note: If you are converting your T78 air wheels to poly wheels, be sure to order the correct (16 mm) wheel spacers. 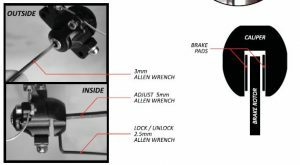 Remove the air wheels using two 5mm Allen wrenches. Note: Move the brakes one at a time so you can use them as reference for spring position and orientation. There are three holes on the frame for the brake pad axle bolt location and three holes for the spring. For your brakes to function properly you will need to move the location of the brake to the third hole closest to the wheel axle. Position the spring first; make sure the spring is in the right orientation. Note: if the brake is installed and you do not have tension on the brake from the spring, check the orientation of the brake spring. If the spring is upside down you will not have tension. Once you have the brake pad axle in place do not tighten the brake axle nut yet! First install the poly tires using the new 16.mm wheel spacers. Once the wheels are installed you will need to adjust your brakes. Loosen the two bolts that hold the cable to the brake pad using a 3mm Allen wrench. Pull the cable toward the front of the Trikke leaving a slight gap 3mm to (1/8″). The Desired result is to set the brake pad as close to the wheel as possible without the brake pad rubbing on the wheel. 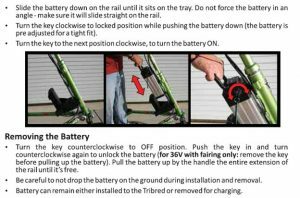 Note: If you are having difficulty with your Trikke not rolling or you notice the brake pad is rubbing on the tire you will need to fallow the brake pad adjustment procedures. Make sure the brake tension adjustment screws are tightened as far into the brake lever as they will go. Loosen the two bolts (do not remove) that hold the cable to the brake pad using a 3mm Allen wrench. 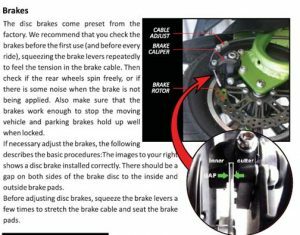 Warning: if you failed to adjust your brakes properly during or after assembly and your wheels are damaged your Tires will need to be replace before you can safely ride your Trikke chambering vehicle. Note: If at any time during brake adjustment procedures, you strip the 3.mm bolt on the brake pad you will need to replace the bolt for safe and reliable braking. Please contact Trikke at 1-877-487-4553 to order any replacement parts. Warning: remember to use caution when working with tools. Always ware safety goggles and other proper safety gear fallowing the correct safety procedures for each specific tool. Use the Dremel Tool or hacksaw to cut a slot across the top of the stripped bolt head. Cut approximately halfway through the bolt head. Note: Make sure to center the saw/ cutting tool over the middle of the bolt to there is equal amounts of the bolt material on each side of the cut. Note: Make sure to cut vertically into the bolt head only. Avshape will make it very difficult to remove the bolt using a flat head screw driver. Using a large flat head screw driver, cautiously remove the damaged bolt. Take care not to damage the bolt head further. Once the bolt has been removed, replace it with a new bolt (part # BT-026) using a high-quality 3mm hex head (Allen) Wrench. Tighten Fully, Be cautious to not over tighten and strip the new bolt. Remove the Bearing’s from the rim and check the bearing seat. If there is access material in the seat you will need to remove the material. Grease the bearing seat using a premium bearing grease. Make sure the bearing spacer is the correct length and that the bearing is seated properly by turning the inner bearing race against your finger. Make sure the 2 Front fork bolts on your Trikke are loose enough for the clamp to have sufficient space to allow the steering axle to fit inside of the fork clamp. If you still have difficulty installing the fork you can loosen the wheel axle and this will loosen the fork clamp a few more millimeters allowing sufficient clearance. Depress the alignment push pin on the lower steering axle and slide the fork onto the steering axle until the lock pin engages in the fork alignment pin hole. Tighten the 2 fork bolts and tighten the wheel axle if it is loose. To remove the front fork. Loosen the two fork bolts and depress the alignment pin on the lower front steering axle. Now you can remove the fork assembly. Note: If you are having difficulty removing the fork at this point, Loosen the wheel axle this should give you a few more millimeters of clearance in the fork clamp to allow removal. Loosen the bolt on the handlebar stem clamp. Loosen the Top nut on the threaded headset. Slightly loosen the bottom nut on the threaded headset. Note: this nut pulls the steering axle up through the front structure. If the nut is over tightened you can compress and damage the bearings. Tighten the bottom nut so the steering axle is tight. Make sure to turn the steering axle to insure that the bottom nut is not over tightened. Using two wrenches tighten the top nut while holding the bottom nut stationary. Note: this will lock the two nuts together and will not allow the bottom nut to loosen, effectively holding and compressing the bearings. Tighten the bolt on the handlebar stem clamp. How to adjust the brake cables? 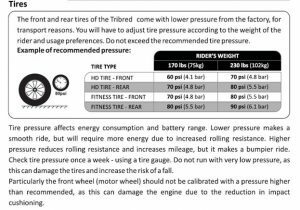 What’s the recommended air tire pressure? Make sure the battery key is set to unlocked position before installing. I am having trouble locking the battery into place on the Pon-e. When turning the key there is resistance and it seems that the locking mechanism on the battery is not lining up with the battery track on the Pon-e. The battery was adjusted tightly to the tray. This is important to minimize play at the power connector on the bottom. The box that has the 1-2 speed switch… Yank it down with some force, and the whole tray should move a little, making it easy to turn the key. If you went too far, pull the tray back up, now with the battery locked to the rail.